The Angel Orensanz Center the oldest surviving synagogue in New York City, and the fourth-oldest surviving synagogue building in the United States. Since the structure was built in 1849, it has experienced a rich history and has been the setting for many Angel Orensanz Wedding Photos. The building’s distinctive Gothic Revival style and the influence of the Spanish artist Angel Orensanz, who purchased and renovated the space in 1986, make it a very unique wedding venue. Angel Orensanz Wedding Photos have a flare and beauty that bring the images to life. This wedding took place on New Year’s Eve and the magic of the evening was palpable as the bride and groom danced with family and friends. The wedding photographs I took that night were filled with images of utter joy and celebration. 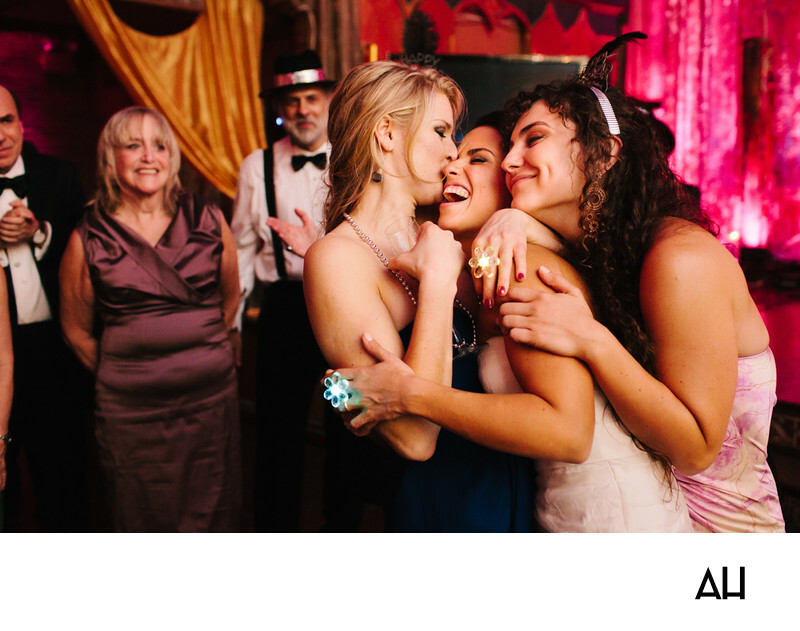 This picture shows that joy well, with the bride laughing and hugging two of her friends in a room exploding with color. The glow rings on the fingers of the girls are a small symbol of the lighthearted fun that filled the evening. Those around the bride and her friends smile as they gaze at the girls, who have stuck by one another throughout the ups and downs of life. It is only fitting for the two friends to be here with the bride for her wedding. It is clear that the girls are enjoying the party and are truly happy for the bride on her special day.